I’m going to unpack that “outdated advice” part in the tip pictured above. For reasons I still haven’t figured out, misconceptions and outright errors (“alternative facts”?) about slip stitches are still repeated uncritically in English-language crochet books. This has been going on for decades. Think about how it affects whole generations of crocheters. It’s the only reason it took me 30 years to try crocheting a whole swatch of just slip stitches. I was immediately smitten. My first slip stitch design was the 2004 Pullover Shrug (the cropped purple top I’m wearing in the tip above). I have distilled every fake fact about slip stitches into the following four sentences, below. I begin my Slip Stitch Crochet 101 classes with them so that we can deal with them head on. Can you spot all the unhelpful advice? 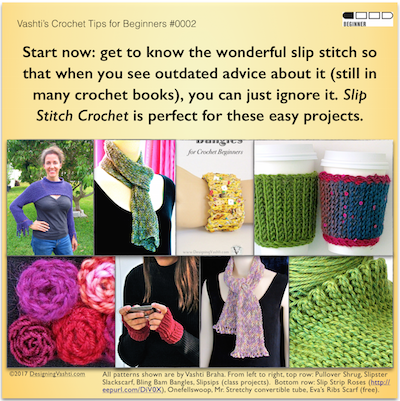 There is one kind of slip stitch and you crochet it tightly. It is useful only occasionally, for a few things, such as joining a round, closing a picot, or seaming. Don’t bother trying to make anything with it, it has no height. It doesn’t really count as a stitch at all; it’s a non–stitch. (I underlined the fake facts to help you.) This false information discourages crochet beginners and all crocheters from exploring only slip stitches, not other basic stitches. Why? It’s not because slip stitches are tricky for beginners. It’s the most basic crochet stitch of all, along with the chain stitch! In my classes, the experienced crocheters struggle more—but that’s just due to the years of misinformation. 1. Think of slip stitches as a group of stitches. “Bosnian” crochet: slip stitches crocheted in the round with no turning. Slip Stitch Crochet is actually a whole technique. When you know this, you can retain what you learn about them easier. It also spurs innovation, and aids pattern writing. I use the abbreviation SSC, as do others in the international SSC community. Slip stitches look, feel, and behave very differently when crocheted with turning or without (“Bosnian”), and in just the front or back loop or both (or between stitches!). Invert them or twist their loops for more slip stitch types. 2. Go up at least two crochet hook sizes to crochet them loosely. Big-hook slip stitch is especially fun! Start with your bounciest wool yarns. 3. Slip stitches are exceedingly versatile, useful, and pleasing for many of the things crocheters make. In fact, slip stitches are often preferable to other stitches, such as for ribbing, or for a thin, supple fabric that conserves yarn. 4. Slip stitches clearly have height. How odd that it needs to be stated. The simple evidence is the heaps of very wearable scarves and sweaters. You should see the overflowing table of them that I bring to classes! Yes, you can even crochet around the post of a slip stitch. Please Don’t Wait Like I Did. I learned about crocheting slip stitch projects decades after learning how to crochet everything else. There’s no reason for crochet beginners to wait decades like I did!